The 1998 WAHO Conference has been a major success. All those attending (250 people from 45 countries, with 39 countries represented by Voting Delegates) agreed that this was probably one of the most positive and productive WAHO Conference ever held. 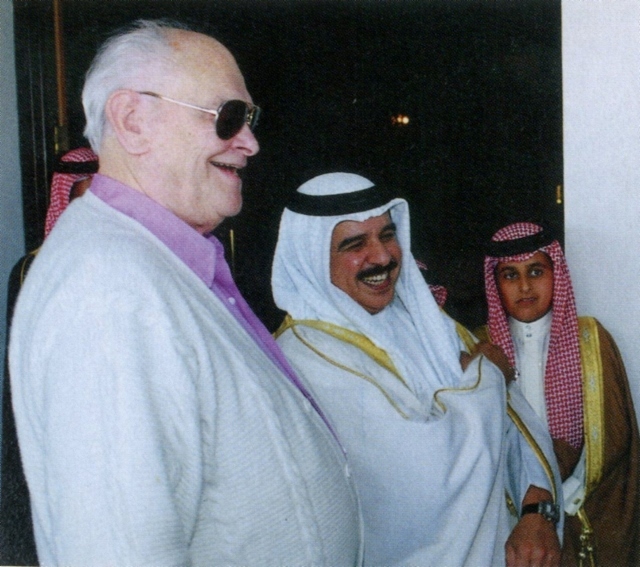 The beautiful and friendly island of Bahrain – Pearl of the Gulf – was the perfect setting. The warm and friendly welcome by HH The Crown Prince Sheikh Hamad bin Isa Al Khalifa and the people of Bahrain was wonderful. Crown Prince Court’s Conference Committee, led by Sheikh Mohammed bin Khalid Al Khalifa, had arranged a most interesting and varied schedule of events with impeccable organization and wonderful hospitality. 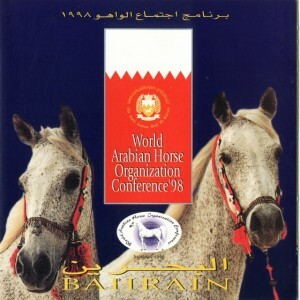 This, combined with the fascinating Arabian horse heritage of Bahrain has left a very happy memory of the Bahrain Conference for all who were lucky enough to be there. 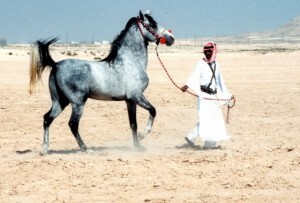 For many people, the rare opportunity to see the Arabian horses of Bahrain – true desert Arabians bred for centuries as war-horses, unchanged by show-ring fashion or racing requirements, was an enormous bonus. There were two horse presentations, one of the Amiri Stud horses entitled The Inherited Treasures of Bahrain which took place at HH The Crown Prince’s beautiful private Al Saffriya Stables, and one of the horses belonging to HH Sheikh Mohammed bin Sulman Al Khalifa at the desert location of Umm Jedder Stud farm. At Al Saffriya, HH The Crown Prince Sheikh Hamad bin Isa Al Khalifa personally welcomed all the guests. 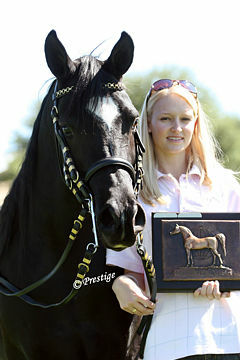 The horses were presented in the late afternoon in a most original way. 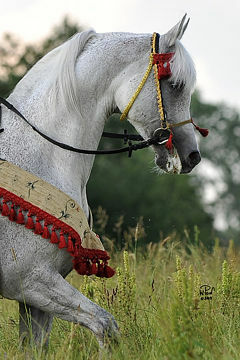 First of all they presented 3 groups of mares – grey, speckled grey (marshoosha in Arabic), and bay. 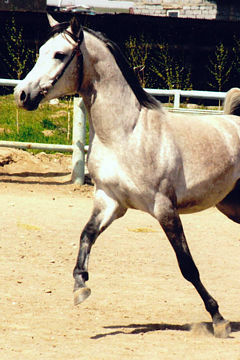 Each Arabian horse in Bahrain still has its strain name, followed by the given name. 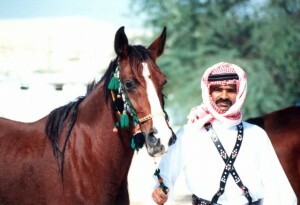 Some strains in Bahrain are very rare, and some are known only in Bahrain. 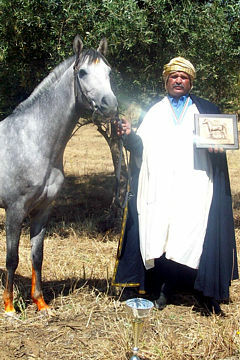 Many people recognized strains such as Kuheila’t Aafas (the same family as the famous stallion which went from Bahrain to Poland in 1936), and particularly liked the grey mare Kuheila’t Aafas Kharaayid (1990, Hamdaany Shahab/Kuheila’t Aafas Reem El-Nufood). Other well known strains included Hamdanieh, Jellabieh, Saklawieh, and Ma’anaghieh. 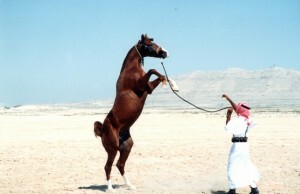 One of the bay mares, Tuwaisah Ttaraayif, was particularly admired for her elegant neck and free movement. 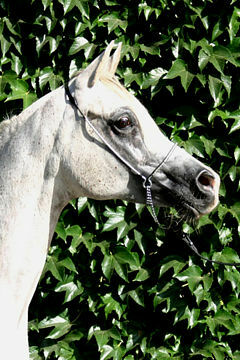 One of the speckled (or fleabitten) grey mares was from a less common strain, Mlolesh. 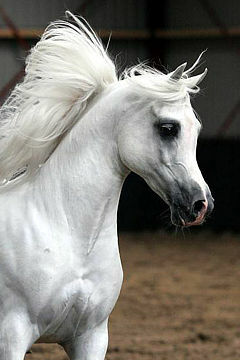 Her name was Mlolesh Al Yatima Radhwah, and she had such a heavily speckled coat that she was almost black. 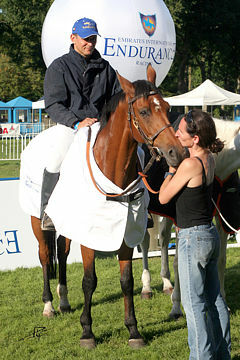 She was a very pretty mare, and very much the crowd’s favourite, especially as she was heavily pregnant. 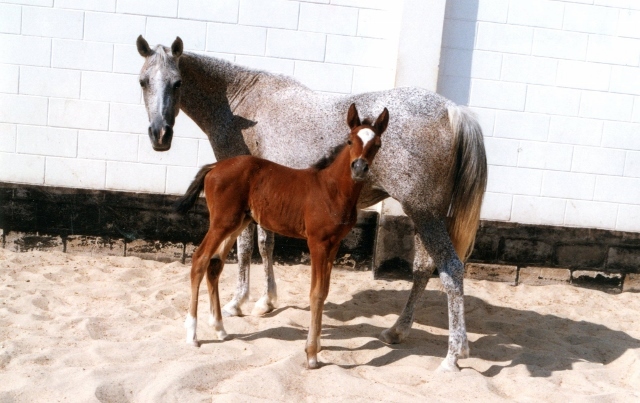 The next day it was announced that she had given birth later that night to a filly foal by Jellaby Muzaahim, and that mother and daughter were doing well. 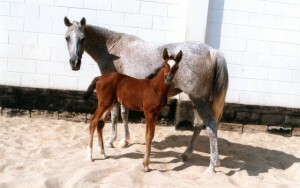 The foal was named Mlolesh Waho. This news was greeted by loud applause. 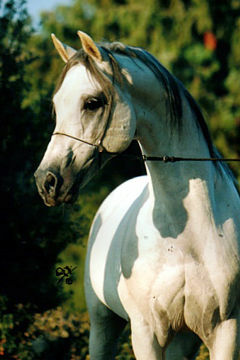 There followed a group of bay mares all sired by the same stallion, 16 year old Jellaby Nejib, who joined the group of his daughters with evident pride. 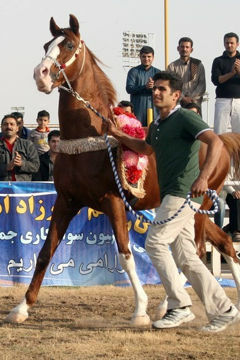 The stallions were then paraded. 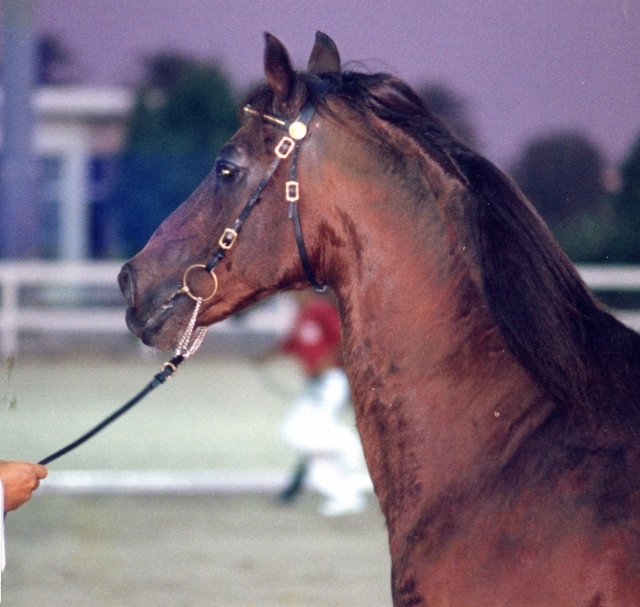 A particular favourite among the senior stud stallions was Musannaan Al-Meemar (1981, Jellaby Alasil/Musannah), a deep-bodied compact grey with beautiful large eyes. Others to catch the eye were the well built grey Obeyaan Sari (1993, Jellaby Nejib/Obeyah Danaanir) and the elegant dark chestnut Jellaby Shagraan (1990, Hamdaany Shamikh/Jellabieh Fawz). Finally, as night fell, a large group of mares were released into the arena, to give people an unforgettable image of true Arabian war-mares, free moving, powerful and elegant, their eyes reflecting the light of the full moon. 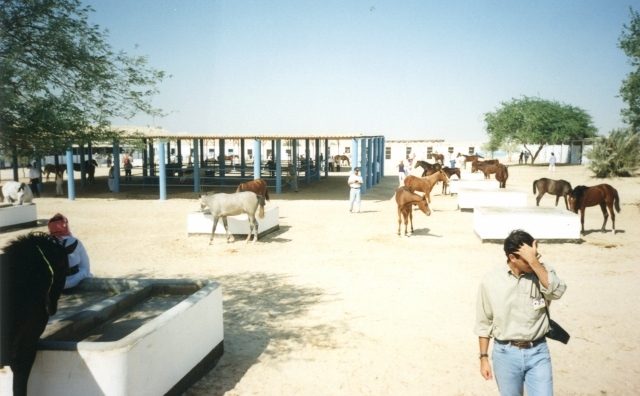 At HH Sheikh Mohammed bin Sulman Al Khalifa’s Umm Jedder Stud farm, we were treated to a group of horses kept in the traditional way. 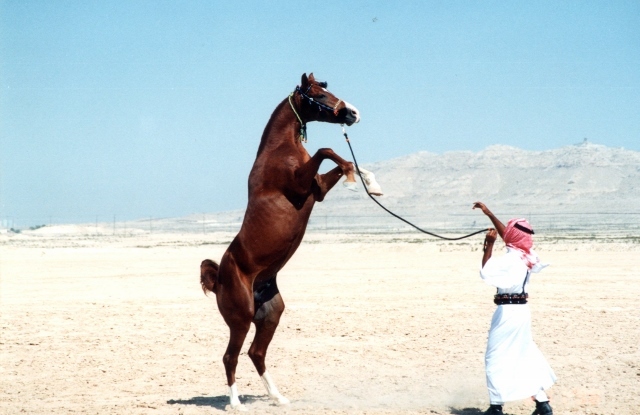 They live outside all year round, tethered by one pastern, because ‘a true Bedouin will never insult a horse by tying his head’. They do have shelters from the hot sun. All the horses are taken to water twice a day, and some of the stallions are ridden. The Arabians of Bahrain are renowned for their excellent temperaments, with a calm, intelligent and friendly attitude. 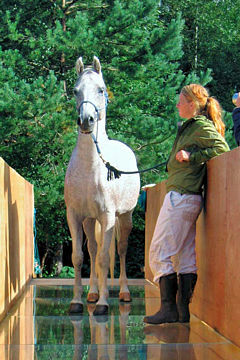 Stallions and mares live in close proximity, peaceful and content. 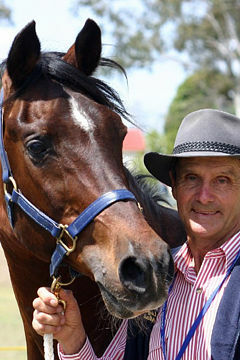 Mares with foals, and weanlings, do have paddocks for exercise. 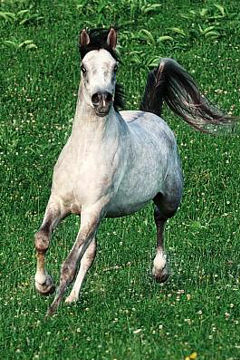 The diet of dates, wheat bran, a little barley and fresh alfalfa seems to keep these horses in excellent condition. Everyone was surprised when it was explained that this summer Bahrain had its hottest summer on record, with temperatures reaching 50 Celsius. 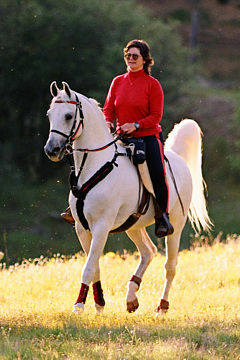 These horses had lived outside, on their tethers, and come through the most testing conditions in remarkably good health. 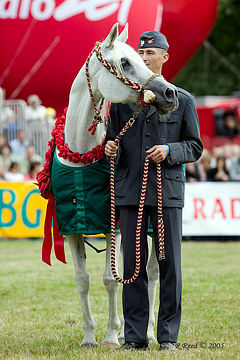 The horses, both mares and stallions, were presented by strains, in traditional halters and with the handlers in traditional costume. Considering that these horses had never seen more than a handful of people at any one time, they coped remarkably well with the sight of large tents full of strangers staring at them. 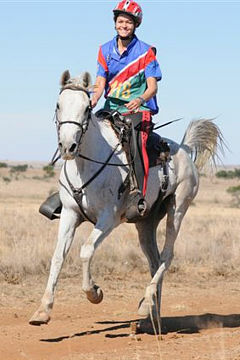 As each horse was led away after being presented, to return to his or her friends, without fail they flagged their tails and pranced away, proud of themselves and so light on their feet, exhibiting a freedom of movement which was particularly noticeable. 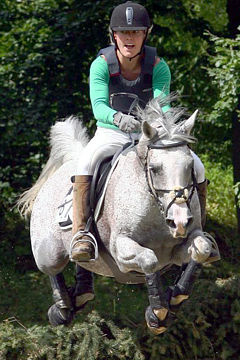 The stallions in particular seemed to enjoy the chance to show off. 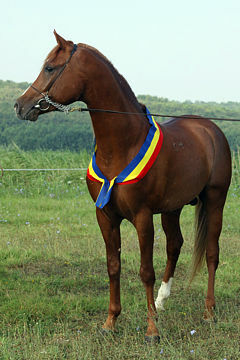 Other features included good flat bone, strong clean tendons, well laid-back shoulders and tremendous depth of girth. 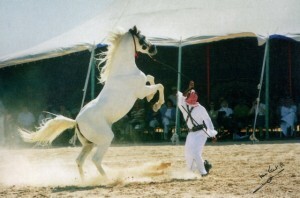 From the group of stallions, particular favourites of the crowd included the tall grey Jellaby Kher (1986, Rabdaan Alwasmy/Jellabieh Alkhara), one of the senior stallions at the stud who also appeared to enjoy his moment in the spotlight, and his son Saidan Gharib (1993 out of Saida Hind). 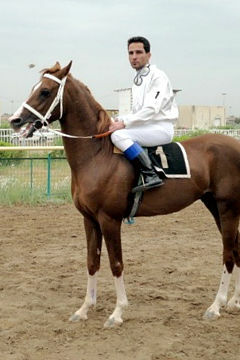 Also admired were the grey Dhahmaan Shaban (1988, Mlolshaan Almarsoosh/Dahma Umm Amer) as well as his maternal half-brothers by Rabdaan Alahmar, the chestnut Dhahmaan Alashgar (1994) and the bay Dhahmaan Faraj (1995). An entertaining afternoon was also spent at the races, including a special race named the “WAHO Cup” in honour of the occasion. 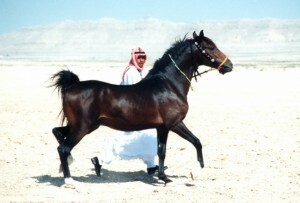 Racing is a part of the heritage of the Arabian horse in Bahrain, as it is in so many countries. 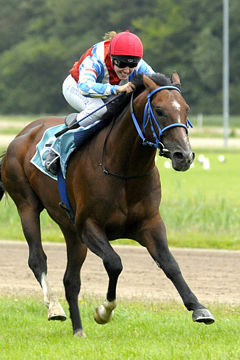 Young stallions especially are tested on the racetrack for soundness in wind, limb and temperament, before being used for breeding. 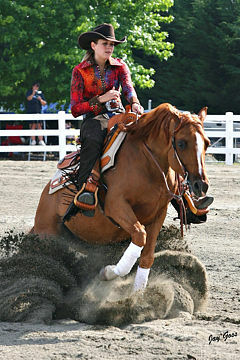 Many of the mares also race for a season or two before starting their maternal duties. 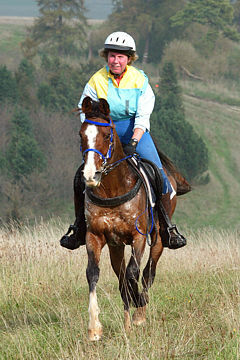 Away from the horses, the business of WAHO during the conference sessions was good-humoured and forward-thinking. 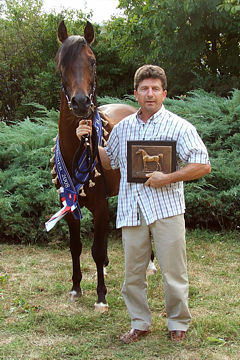 Once again, this meeting has reaffirmed that WAHO is a true family of nations, brought together by their unswerving loyalty to the Arabian horse world-wide. 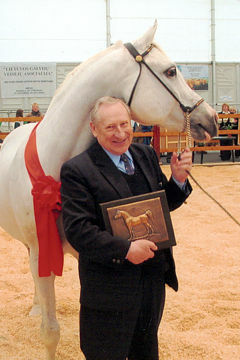 The major achievement at this Conference was the Unanimous vote by all delegates to re-confirm the WAHO Definition of an Arabian horse, first written and approved in 1974. 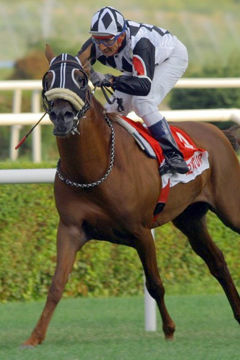 Since that date, the greatest wish has been for all Registering Authority Members of WAHO to trust each other’s stud books and get rid of all the old suspicions and worries about pedigrees. The WAHO Definition of an Arabian horse is as follows: “A purebred Arabian horse is one which appears in any purebred Arabian Stud Book or Register listed by WAHO as acceptable”. What happened in Bahrain was that the Member countries present not only voted to re-confirm the WAHO Definition, but they debated at length and then voted unanimously, that the WAHO Definition be made mandatory to all Member countries. This was something that was very much desired by the delegates present, and was not something pushed forward by the Executive Committee, which was most important to all. 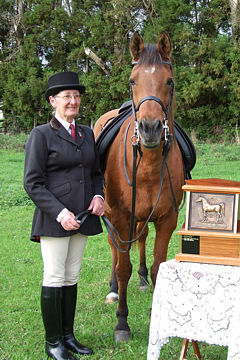 This vote means that acceptance of all horses in WAHO-approved stud books is now compulsory, and proves that all the Registering Authority Members of WAHO now trust each other and each others’ stud books or registers and all the old suspicions and worries have now disappeared. 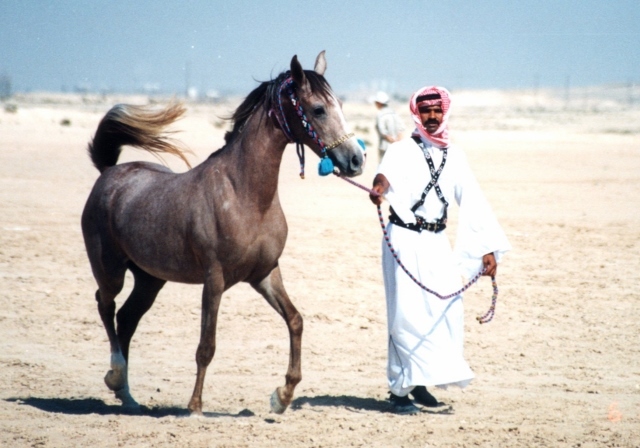 At this meeting, a line was drawn in the sand, past mistakes acknowledged as unchangeable, and WAHO countries can now move forward in unison to ensure that the Arabian horse continues to flourish and be enjoyed all over the world, into the next millenium. 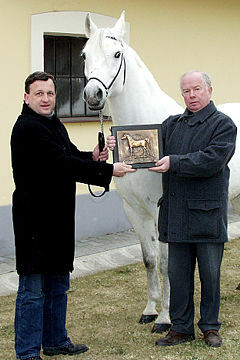 Amongst the other business discussed, the most important votes included the introduction and unanimous re-election of the WAHO Executive Committee; and the acceptance of three new stud books into the Definition – that is to say Bulgaria, Czech Republic and Pakistan. 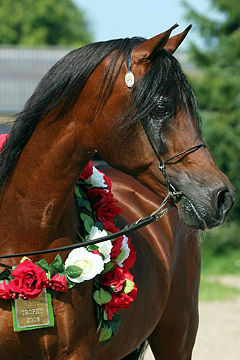 There was also a discussion as to whether the world’s stud books should be closed to new ‘original Arabians’, at the end of which it was unanimously voted not to close the books. 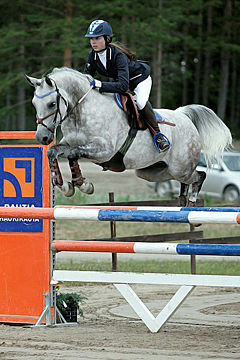 Other topics included the practical use of passports and the standardization of stud books and computer software systems for registries. Both these topics had been previously discussed in more detail at the highly successful Registrars’ Meeting. There was a fascinating talk on the change-over from bloodtyping to DNA-typing by guest speaker Dr. Michael Scott of the Animal Health Trust, UK; and Melissa Paul of the W. K. Kellogg Arabian Horse Library gave an illustrated talk on their wonderful collection of rare books. At the end of the Conference, all those present gave WAHO President, Jay Stream, a standing ovation in recognition of his outstanding efforts and leadership over the past 28 years. 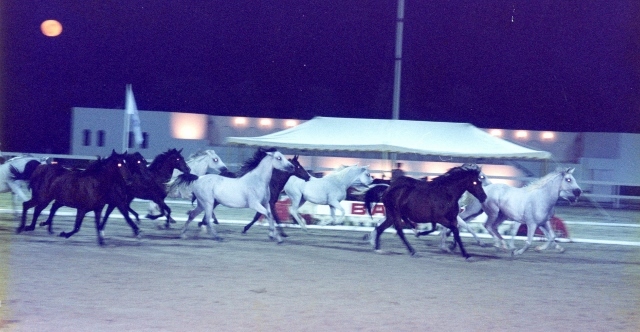 To conclude, the 1998 WAHO Conference in Bahrain was universally agreed to be one of the most positive, productive and friendly meetings in the history of WAHO, with every country recognizing that they have a duty of care to the Arabian horse – this most international of breeds, all over the world. We all look forward to meeting again on Australia’s Gold Coast in November 2000. 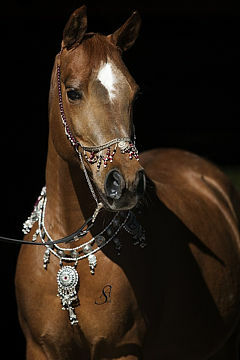 Photo credits Amiri Arabian Stud of Bahrain, Jehangir Rustomjee, Jenny Lees, Mahmood Hasan and Bert Van Lent for Arabian Horse World Magazine.